March is Brain Injury Awareness Month, and organizations like the Brain Injury Association of America (BIAA) want people to know more about these dangerous injuries and their aftermath. Here’s a little information to help. Brain injuries involve acquired damage to the brain. The damage is not the result of heredity, congenital defects or degeneration. There are many possible causes of brain injury, including certain infectious diseases, oxygen starvation, seizures, stroke, exposure to toxins, trauma and tumors. According to BIAA, more than 12 million Americans live with the impact of brain injury. A subtype of brain injury is traumatic train injury, or TBI. The US Centers for Disease Control and Prevention describe TBIs as brain injuries “caused by a bump, blow or jolt to the head, or a penetrating head injury that disrupts the normal function of the brain.” TBIs are most often the result of falls, but can also result from being hit by an object, a motor vehicle accident or an assault. BIAA tells us TBIs affect at least 2.5 million people each year. Every 13 seconds, someone in the US sustains a TBI. About 2.2 million people are seen in emergency rooms, 280,000 are hospitalized and 50,000 die each year due to TBIs. In addition, one of every 60 people in the US lives with a TBI-related disability. TBIs range from mild, what we know as concussions, to severe, where there’s an extended period of unconsciousness and resulting disability. The majority of TBIs each year are concussions. 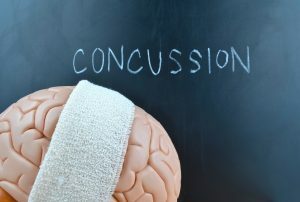 Concussions are caused by an injury, such as “a blow to the head, that jars or shakes the brain inside the skull.” Some people might have a cut or bruise on the face or head, but generally, there are no visible signs a concussion. You don’t have to lose consciousness to have a concussion, but many people do. Sometimes, someone with a concussion will look a little dazed and might forget what happened just before the trauma occurred. Most people fully recover, some within a few hours, but some need a few weeks. Concussions have become more common in sports on every level. This may be because of a growing emphasis on the risks for them, especially in contact sports such as football. Fortunately, many coaches and trainers have been taught how to recognize symptoms of concussion in their players and participants. Severe brain injuries are those that cause unconsciousness or coma that generally lasts no more than a few weeks. When these injuries do not result in death, they are typically catastrophically disabling. Some patients will remain in a coma and others will enter a different type of unconscious or minimally conscious state. People with severe brain injuries rarely recover. Those who do are typically left with a range of physical and neurological deficits that are difficult to overcome. Brain injuries that do heal, don’t heal the same way as other injuries like broken arms or legs. Healing involves a recovery of brain function, and how much and how fast varies. No two brain injuries are alike, so each person’s response to injury and recovery from it are different.